“Secret Paradise” is a three story luxury newly remodeled beautifully decorated 5 bedroom, 3 full and one half bath home, boasting 3000+ square feet of living space. The home is located in the upscale gated community of Emerald Shores. This beach home is located only 500 yards from the spectacular white sand and clear breathtaking water of Destin. Spend a week with us and you will know why we named our home “Secret Paradise” We pride ourselves on great customer service as I am a homeowner that manages my own home. I will personally call you after I confirm your booking to discuss your vacation needs:)**We are a family rental property only and do not rent to singles under the age of 25 and/or chaperoned groups, no exceptions. Our home is located on a quiet cul-de-sac between the two private neighborhood pools; a short two minute walk takes you to either pool (one is heated seasonally), tennis court, basketball or shuffle board. 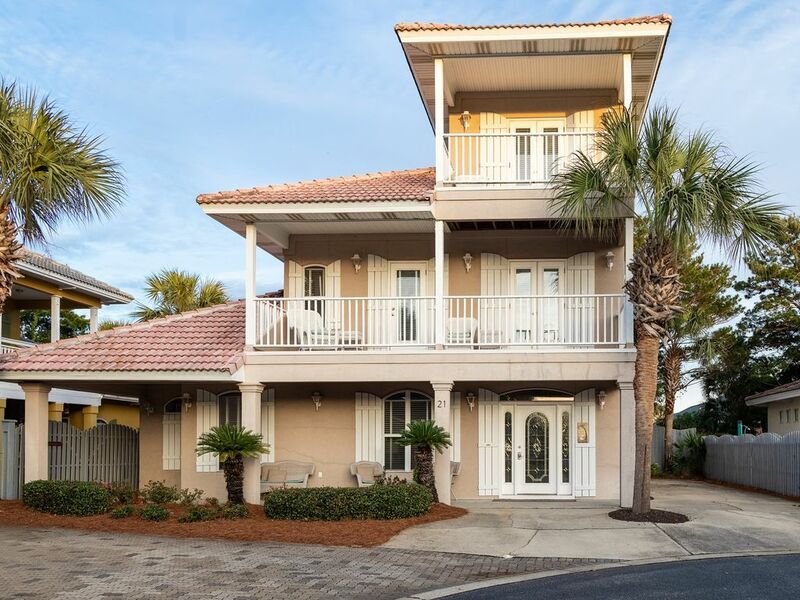 Emerald Shores is the only neighborhood in the Destin area with its own private pavilion on the beach with bathrooms, shower, picnic tables, sun deck, with a snack bar(offering cold drinks, snacks and food items), plus private deeded beach owned by the subdivision. During summer months Emerald Shores offers a FREE shuttle service to take you to the beach or you can enjoy the short 5 minute walk through the tropical neighborhood to get to the beach using our wagon to bring all your toys and chairs. We offer a rolling cooler to bring all your refreshments. We also have a closet full of beach toys, rafts and a couple beach chairs to share with our guests! Beach service (umbrella and chair rental for an extra fee) is available as well or you may bring your own. “Secret Paradise” is newly upgraded and the interior living room has been freshly painted and professionally decorated with luxury vinyl plank flooring added on stairwell, hallway and all 2nd floor bedrooms in March of 2016! Are home is detailed and well appointed each year to keep our vacation home rental fresh and up to date! After entering through the leaded glass front doorway you will be welcomed with a large open floor plan to enjoy. The spacious living room has plenty of comfortable seating including 2 sofas, a 52' HDTV, dining area with over sized wood table for eight and fully-equipped gourmet kitchen with french door stainless steel refrigerator and full size appliances, stone back splash, upgraded maple cabinetry and Corian counters with 5 bar stools for counter top dining. We also have a booster highchair for the babies visiting. Kitchen also has a large pantry as well as a door to the back covered patio with propane grill to extend outside dining. First floor has NO steps and has three entries for added convenience. We offer a propane grill and we will reimburse our guests if they tank needs a refill while you are vacationing. The spacious KING first floor bedroom has fresh decor that boasts a KING size solid wood carved poster bed,new mattress added October 2016! 32 inch TV, and DVD player. Attached is a Renovated full bath with over sized shower with new vanity, granite counters, sink, shower doors and wood look porcelain tile flooring. The first floor also has a full laundry room (complimentary laundry detergent) NEW high efficiency top loader washer added October 2015, New super capacity dryer added October 2016, with deep sink, iron, ironing board, drying rack, and door to front porch. A newly upgraded half bath that has a designer styled vessel bowl sink with new granite and new vanity is an added convenience located on the first floor! Extra wide stairwell with vinyl plank flooring leads to the second floor with three addition bedrooms also appointed with upgraded vinyl plank flooring, porch access, local artisan custom made desk, large Renovated full bath with new double sinks, granite counters, new vanities, makeup vanity with stool, new tile flooring, new shower doors to tub with shower. The first second floor bedroom features KING size bedroom suit, flat screen 32 inch flat screen TV, DVD player, French doors to large covered porch, and large closet. Additional bedroom has 2 TWIN beds and a QUEEN sleeper sofa, 32" flat screen TV and hosts 4 people. Also a third bedroom on the second floor has a QUEEN bed and deluxe FULL futon, large closet, and 32" flat screen TV and DVD player finishes this floor. Venture up to the third floor for a private luxury suite! KING size bed tropical carved poster bed awaits with French doors to a private balcony that is great for relaxing and watching the sunset. This room features upgraded full bath with newer vanity with granite counter, shower, closet, flat screen 32 inch flat screen TV, DVD player and a chair for comfort or for reading a good book. We offer FREE Wi-Fi, local phone, multiple TVs all bedrooms have a 32" flat screen TV, DVD players, and cable. The home has 4 large covered porches for relaxing and enjoying your stay each porch featuring patio furnishings. A propane grill is offered and we will reimburse by providing free propanel, if you need to exchange the tank while vacationing text or call me and I will reimburse you for the tank. Also a wagon and rolling cooler are supplied for your use to bring your things to the beach or pools. The home features two hot water tanks and dual ac units. Every bedroom and also the living room has ceiling fans. All linens and towels(excluding beach towels)are provided. A Pack n Play crib and booster highchair is offered for babies visiting. Private driveway for parking 3/4 cars. Destin has so much to offer everyone. If you are looking for more to do than enjoy the beautiful white sandy beaches and emerald waters there is plenty more to do. Destin is a shoppers dream with Destin Commons (upscale outdoor shopping plaza) now including Fish bowl bowing alley new in 2014, Silver Sands Outlet mall (largest designer outlet mall in nation, over 100+ outlet stores), and The Village of Baytowne Wharf (outdoor boutique shopping with restaurants). All located within 2-3 miles of “Secret Paradise”. Destin is also known as the “The World’s Luckiest Fishing Village”. The Harborwalk Village is located in the fishing harbor of Destin. Home to the Fishing Rodeo this harbor has charter boats and multiple activities for the whole family. Dining out in any of the area restaurants is a great way to spend an afternoon. Walking distance are a few beachside dining options. Sitting beachfront overlooking the beautiful views is a great way to enjoy the moment. Come see for yourself why Destin has become our “Secret Paradise”! Located in Emerald Shores, Destin Florida. Search to find our more about our gated community and Emerald Shores By Owner. We are the owners of 'Secret Paradise' located in Emerald Shores, Destin Florida. We celebrated our 25th wedding anniversary in 2010 and purchased our beach home that same year. My husband and I were both born and raised in Cleveland, Ohio. Married for 33 years and have two children who are both married and have recently welcomed a new grandchild into our growing family! We are truley blessed. We plan on making many more family memories of our own at our homes Secret Paradise and Simply Paradise! We love the change of seasons up north but always vacationed at the beach. Destin is the perfect beach destination and once we found it we had to spend more time in this place we call paradise! We spend as much time as we can at our beach homes in Destin and are happy to share it with others when we are not there. ​Come see why we call Destin our Secret Paradise! The first time we visited Destin was in the summer of 2008 and found it to be a true Secret Paradise. Born and raised in Cleveland, Ohio we did not know a clear emerald water beach existed in the United States until we found Destin. The bright white sand and clear water is breathtaking! We now own a 'Secret Paradise' and would like to share it with others! We take pride in great customer service and enjoy helping each guest with their perfect vacation so please call us to discuss your travel needs! Secret Paradise is located on a cul-de-sac in the family oriented Emerald Shores neighborhood. We like having a gated community and it's convenient location to the beach. Having two pools to enjoy and a private beach pavilion is a 'one of a kind' offered in the Destin area. Also the free tram service to the beach in peak season is a great feature! A short five minute walk to the beach and also strategically placed between the two pools offered. We not only have three porches on the front of the home we also have a private porch on the back of the home. Our long driveway on the side of the home makes parking your vehicles easy and out of the way. We are so relaxed and comfortable in our beach home and hope the same for you and your family! toilet, shower, 1st fl ALL NEW 2014, granite, new vanity, new shower doors! We offer 3 Full Bathrooms plus a bonus 1/2 bath on main floor that all have new toilets and new sink faucets! Master bath and second floor main bath have been completely remodeled in October 2014! All new vanities, new granite counters, new sinks, new shower doors and all new tile floors! Our 1st floor 1/2 bath has been completely remodeled in October 2015 with designer vessel sink, new faucet, granite counter and new vanity! Recently upgraded the third floor bathroom with granite counter and new sink in 2014. We provide all bath linens but bring your own beach towels. Long driveway on side of house for parking up to three vehicles. Extra parking near pools and tennis court so please put parking pass on dashboard for cars not parked in the driveway. full size oven with bake ware and cooking utensils to prepare full meals! We also provide a propane grill and a charcoal grill and we provide the propane! Enjoy barbecuing or cooking in! Large closet pantry for storing all your snacks. Also we have multiple spices to share. All dishes and utensils needed to cook gourmet meals or light snacks. Plenty of glassware and dishes for large groups. Large solid wood table with 8 highback upholstered chairs, card table provided with 4 chairs, 5 barstools for countertop dining, table cloth and placemats available. Plus high chair booster seat. 52' Sony HDTV in living room, All 5 bedrooms include new flat screen 32 inch tv's and dvd players! Living room has stereo system with CD player. six dvd players. living room and each bedroom has a dvd player. Large balcony on second floor off hallway and bedroom with newly refinished water proof coating . Private balcony off third floor suite also newly refinished. Bikes can be rented for a weekly fee by a local company with FREE delivery and pick up as a convenience directly to our beach home. Boat and pontoon rentals available at the Harbor Walk village! Front large porch. This home has a large front porch, back porch with small table and 6 chairs, second floor balcony with seating, and third floor private balcony. Front covered porch entire length of home to enjoy in any weather. We have added new porch furniture in 2015 for added comfort and enjoyment. many golf courses in the area to choose from located only a couple miles from our home. Two pools, one is heated seasonally. Both pools only steps from home. We had a great time staying in Secret Paradise. We had multiply families with kids but you would never know it. The house is spacious and filled with all the amenities. The kitchen is fully loaded! The beach closet had everything you could ever think of for the beach so pack light! Emerald Shores is a nice private community with beach access and restrooms. We saw dolphins about everyday! We will be visiting again! Can't say enough about the property. First rate accommodations....has everything one would need to have an enjoyable vacation. Easy access to pool / beach, etc...would not hesitate to recommend to anyone looking for a great place to stay. Thanks Linda!!! We appreciate your kind words and so happy you had such an enjoyable vacation! We look forward to your next stay! Wonderful spot for family vacation! Secret Paradise was the perfect spot for our family to meet for vacation. Linda called and introduced herself when we booked and the description of the house was accurate and even nicer than the photos. I have never stayed anywhere where so many extras were provided from waffle irons and griddles to spices to a closet full of beach chairs and boards for us to borrow. 13 stayed very comfortably in the house and there was plenty of seating in the living room/kitchen for us all to hang out and play games and have meals together. The only negative was nothing having to do with the house - it was just Destin in the middle of July was very crowded. I would recommend this property - two thumbs up! I am an owner who manages our own beach home and takes pride in giving good customer service. I like to make sure our guests have everything they need to have a wonderful vacation and feel comfortable in our home Secret Paradise! Glad you were able to enjoy all the extras we provide in our home from multiple griddles to the closet filled with beach items to share. Since our home sleeps 14 comfortably I feel multiple amenities are a must:) If you would like to beat the summer crowds we find other great months to travel to Destin are May, September and October too! Happy to hear you enjoyed family time in our large open floor plan. Look forward to your return. Overall great vacation home, even with 11 people, ..... plenty of room. Linda was great communicating with us for any concerns we might have.......... only one minor issue was quickly resolved. Great summer beach home. We loved our stay. Destin was beautiful and had such a good time and loved the beach. Wish the beach was a little closer but it wasn’t a bad walk. The private access was nice also. The only down side to our stay was the traffic. It was horrible and hopefully when they finish the work on 98 it gets better. But that’s the only negative we had with our stay. We would definitely rent the house again. We are so glad you enjoyed your stay and would stay with us again! We are the only neighborhood in the Destin area with our own private beach pavilion access which is a great amenity with bathrooms, snack bar and rinse showers. Our neighborhood also offers a free tram to take you to the beach so hope you take advantage of that your next visit:) The road expansion on main highway 98 is posing a traffic issue in 2018 but once it is completed it will actually make traffic flow even better so we are excited about the added lanes! Fabulous home with all the amenities you may need. Perfect Open concept floor plan for our 8 adults and 4 children and everyone had someplace to sleep and/or sit. Everyone loved and commented consistently that they loved the short walk to the pool and beach. Private access to the beach and restrooms was really nice. Sand was white and soft. Pool was never over crowded because it was big with lots of chairs and tables, bathrooms. The house had everything we needed with plenty of pots, pans, storage containers and spices for cooking large meals for our big crowd. There was a pack-n-play, baby gate for the stairs, two little strollers and we definitely used the beach wagon to haul the kids and our stuff to the beach. The balcony's and porches were used a lot as well as the kids and adults played in the cul de sac most the time we were there. It was just perfect having a full bath on each floor plus the half bath in the kitchen, living area. The homeowners absolutely thought of everything here and our stay was so easy. The only thing we had to go for was food and I cannot count how many times the men went to Bass Pro Shop. OMG! Linda was attentive, professional, warm and generous with information if we had any questions and the best owner to deal with. I would recommend this home to anyone for sure, it was just simply ideal for us. Can't complain about a single thing. It warms my heart to hear how much you enjoyed your first time to Destin. We also vacation in our beach homes so we try to be sure if we think of something we need while vacationing we add it to our home for our guests:) Making family memories is what vacationing is all about and happy our home made it comfortable enough for you to do that! We look forward to returning in the future. Walking distance to many water front RESTAURANTS, Pompano Joe's, Captain Daves, Crab Trap to name a few, all within one mile or less to the door. Many SHOPPING options within 2-3 miles of home including Destin Commons (outdoor upscale shopping with state of the art 14 screen movie theatre), Silver Sands Outlet (100+ designer outlet complex, nations largest! ), The Village of Baytowne Wharf (boutiques and dining located in Sandestin Resort community), Destin is known as 'The World's Luckiest Fishing Village' with Destin HARBOR located only ten minutes from home includes, Harborwalk Village, charter boats, sunset cuises, jet-ski rental, water sports, snorkeling, shopping, dining, live entertainment, Also Championship GOLF courses are located minutes from Secret Paradise, TENNIS court onsite and multiple other tennis options within miles of home, WATERPARK Big Kahuna is located ten minutes away. We do not rent to chaperoned groups or under 25 year old singles We are a NO pet home and a NO smoking home We accept snowbirds for January and February months only at $1800 per month/4 weeks per month Contact me directly for our homeowner Cancellation policy.